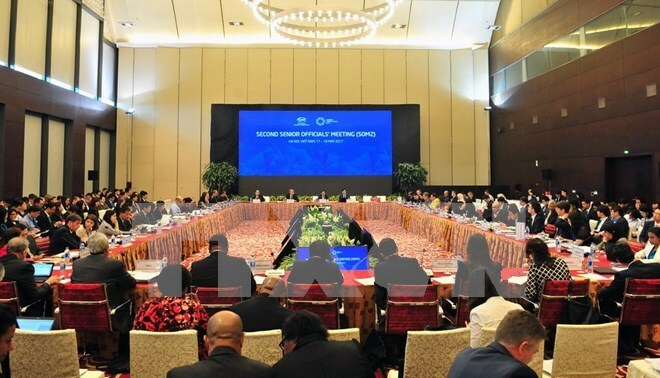 Hanoi (VNA) – The APEC 2017 Second Senior Officials Meeting (SOM2) in Hanoi has focused on discussing APEC priorities adopted at the SOM1 held in Nha Trang city, the south central province of Khanh Hoa in March, according to Do Hong Viet, Assistant to the APEC 2017 SOM Chair. They include priorities on growth, regional connectivity, promoting micro, small and medium enterprises (MSMEs) as well as food security and sustainable agriculture development, he told reporters at a press briefing on May 17. In the May 17 morning session, the APEC senior officials heard reports submitted by the Economic Committee, the Committee on Trade and Investment, and the APEC Business Advisory Council (ABAC) Chair, he said. They paid much attention to debating how to continue supporting the multilateral trade system and help the World Trade Organisation speed up the realisation of agreements relating to the building of the Free Trade Area of the Asia-Pacific, he added. In the afternoon session, the officials plan to hear a report by the SOM Steering Committee on Economic and Technical Cooperation and discuss other cooperation areas including some important initiatives proposed by Vietnam such as the action plan on promoting inclusive development in the financial, economic and social fields, and frameworks on boosting food security, rural and urban development. On May 18, the meeting will discuss the building of the post-2020 APEC Vision and consider recommendations of the Multi-Stakeholder Dialogue on APEC Toward 2020 and Beyond, Viet said. Up to 2,000 domestic and international delegates are taking part in SOM 2 and related meetings. SOM 2 comprises 49 meetings, workshops and dialogues of committees and working groups of the Asia-Pacific Economic Cooperation (APEC) Forum, covering a range of spheres such as trade and investment liberalisation, business facilitation, human resource development, education, network economy, food safety, science, technology and creativity, mining, automobile industry and urbanisation. APEC now groups 21 member economies, including Australia, Brunei, Canada, Chile, China, Hong Kong (China), Indonesia, Japan, the Republic of Korea, Malaysia, Mexico, New Zealand, Papua New Guinea, Peru, the Philippines, Russia, Singapore, Chinese Taipei, Thailand, the US and Vietnam. They together account for 39 percent of the world’s population and contribute 59 percent of the global GDP and 48 percent of the global trade (by November 2016).